Our garden is seriously producing. Also, I’m a little bit afraid I’m going to be so sick of swiss chard (by the end of the season) that I may never eat a leafy green again. I’d had enough chard sauteed with garlic and balsamic (Matt could eat it 2x a day, every day). 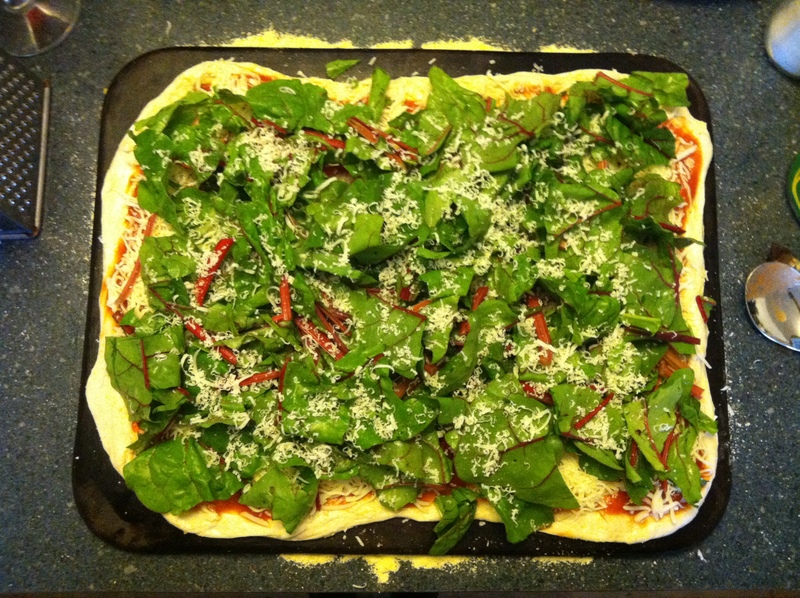 Also, I need to carbo-load so I can dance at PHISH tomorrow, so I thought up a pizza for dinner tonight. BTW, genius pizza stems from the ‘genius’ series of recipes on food 52. I want to go to there. We were all skeptical, but it was so.effing.good! 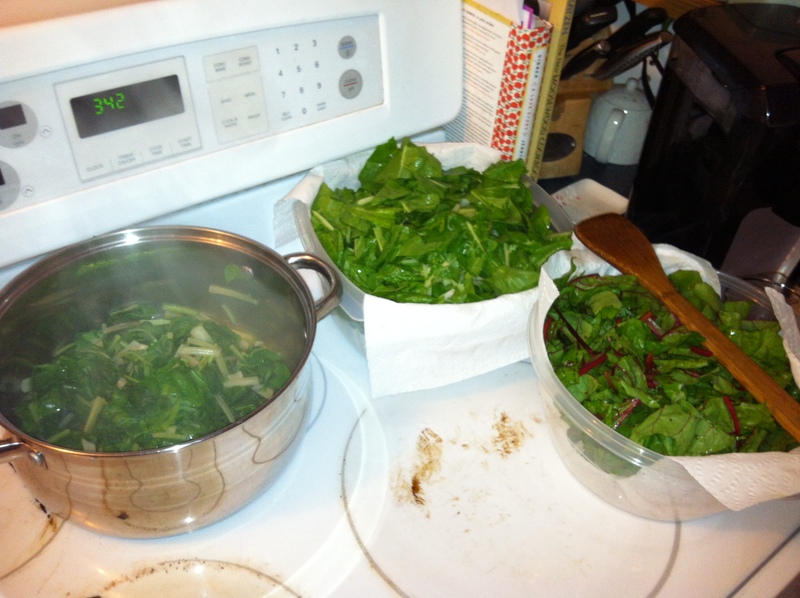 The chard and onions are a crispy contrast to the melted cheese, and even though I had to pat water from the top (use a paper towel – this usually happens with spinach and peppers, too) everything stayed crispy. A total keeper! Place fry or saute pan on the stove on medium heat. Throw in a pat of butter and a couple of glugs of olive oil. Slice onions and throw in the (now warm) pan. Let hang out until they are dark brown and miniscule. Cook at least 20-30 minutes. You can do the next steps while these are cooking down. Take dough out of refrigerator (if you got lazy like me and bought the damn dough). Preheat the oven to 500. 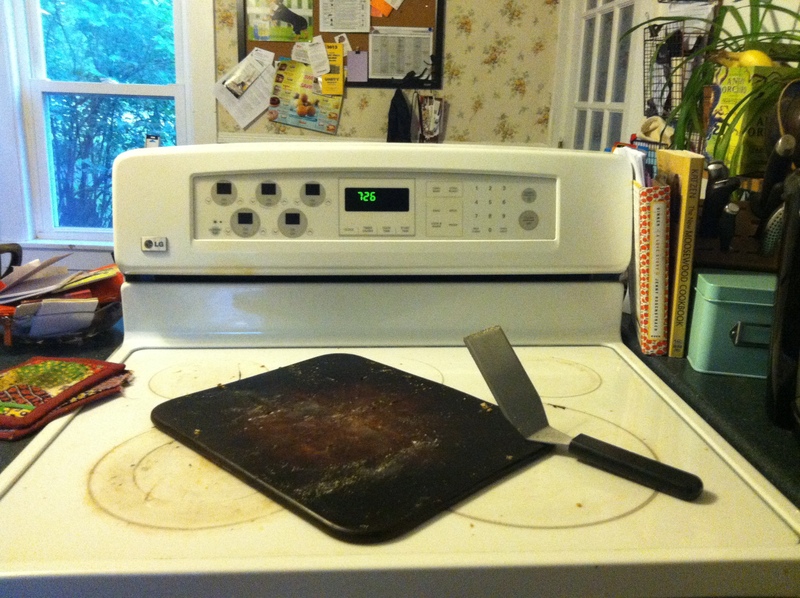 Make sure there is nothing in the oven (dirty dishes, pans you don’t have room for, cookies you forgot about last week). Sprinkle cornmeal on a pizza stone or baking sheet and plop the dough on top. Slop a couple of tablespoons of olive oil on the blob of dough, and begin to spread it out with your hands. This is gonna sound strange, but it works – place both hands on the dough. Press it into a flattish disk. Then take your hands, fingers closed, and place them on the dough. Begin to slowly spread your fingers out. Move to another place and do it again. Soon enough your dough will be stretched nice and evenly. Believe me. Disclaimer: If I could go back two hours, I would have pre-baked the shell for 5 or so minutes just because the chard is so watery. I didn’t do that, and didn’t have any major issues, but I think the crust would have been crunchier if I had pre-baked it. Spread a small can of tomato sauce (or 1/2 a larger one) on the shell. 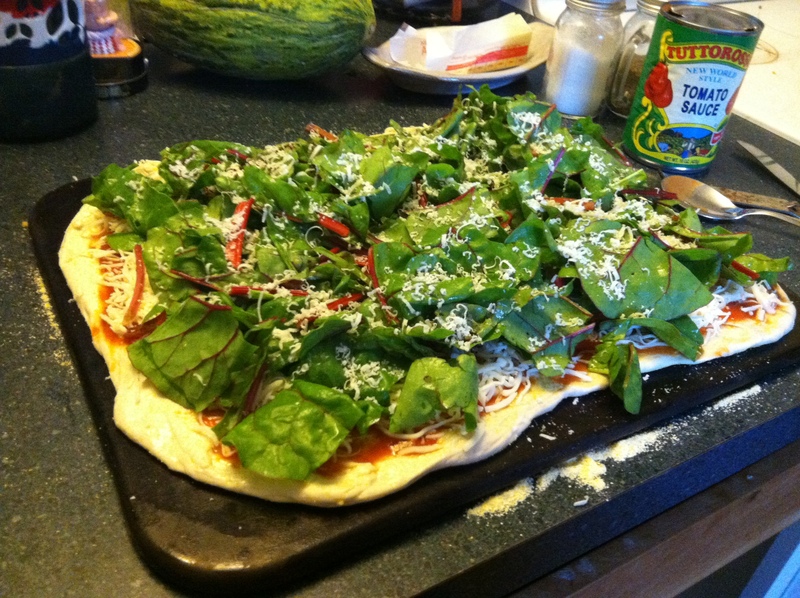 Sprinkle mozzarella (don’t go fresh mozz here – the chard is too watery to deal with any more excess water) liberally. 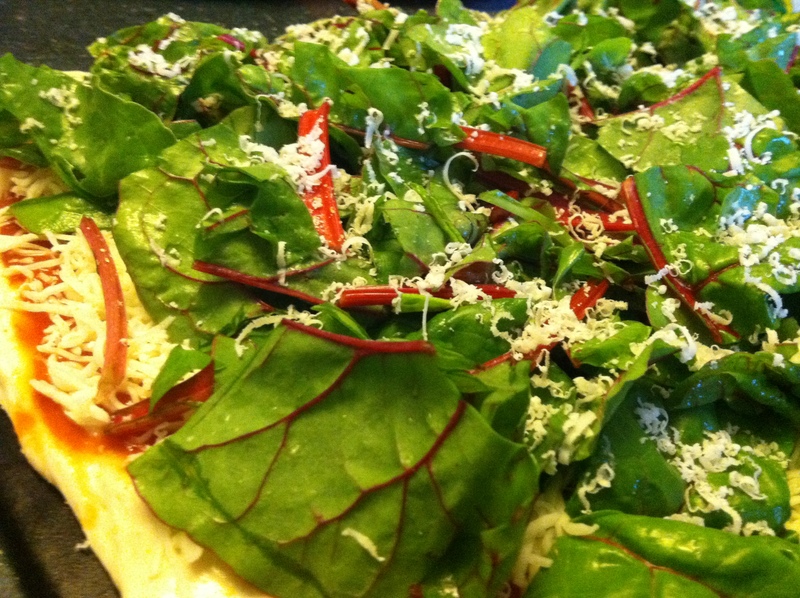 Place big heaps of chopped chard on the pizza and spread out. 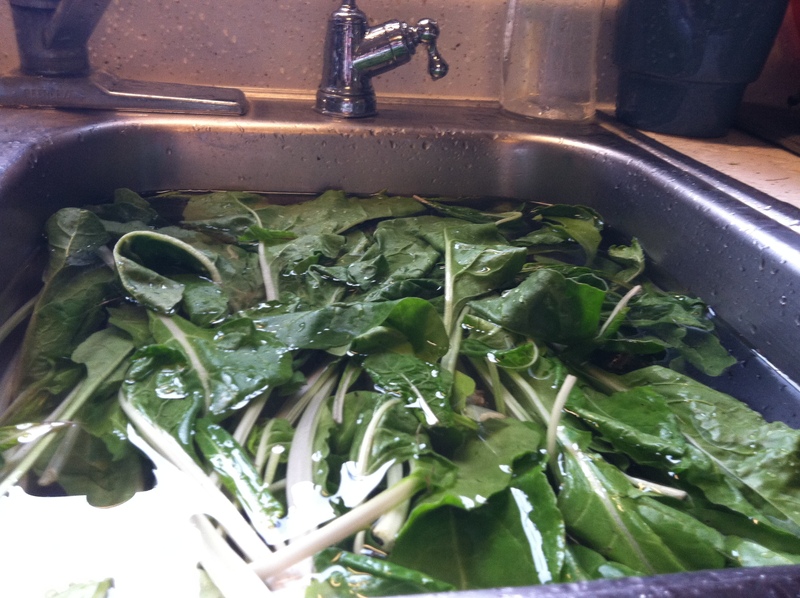 It should look like veritable mountains of chard. It will shrink so so much. Grate fresh parm over the whole thing. Now do that again. Lots of parm, baby. Place caramelized onions on top of the pizza so that every bite will have crispy onions in it. Cook, oh, 20-30 minutes or so. This is a loose time guideline. My oven is notoriously iffy. Sit in the kitchen and drink wine, do the dishes, read a book. Whatever you do, just be sure to turn the oven on every 5-10 minutes to check on the pizza. 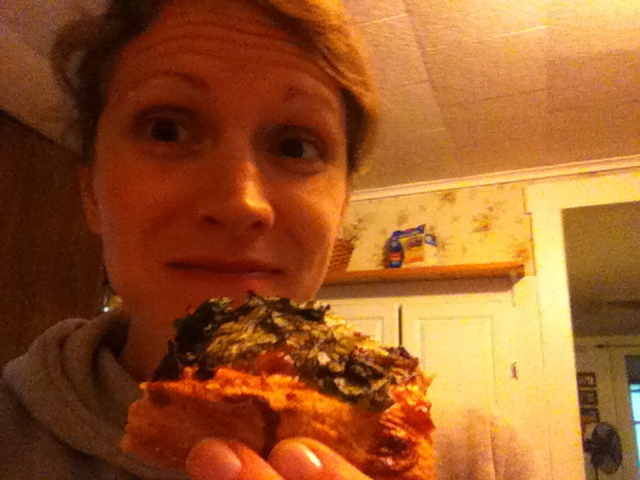 The pizza is done when the cheese is bubbly and the chard and onions are very dark and crispy. … and I eat the last piece. Let cool while you set the table. Eat heartily, my friends.